it just comes in flashes. My Charming and Patient Husband and I took the kids to a Christian family conference last week, and while the kids were in age-appropriate groups for play and singing, we adults heard two exceptional speakers named Bill Butterworth and Rene Schlempfer. They were both very funny, but also had good, broadly applicable messages. Rene structured his talks around Psalm 23. Below I offer first, the Psalm with one word connections to the Sacraments; and below that, my reflections on those connections. To attach this verse to marriage might sound like a stretch. The “lie down” part, however, is more than a bawdy joke or a euphemism. The nature of marriage is both unitive and procreative. Lying down (together) is unitive, and green pastures are fertile and thus procreative. Thus, the verse points not only to the sacrament, but also to its dual purpose. A healthy, sacramental marriage is furthermore a life assistance by sharing burdens, which allows physical, emotional, and spiritual rest. These lines and corresponding sacraments could have been separated, but the verse seems to use them together not merely to name the action of the sacraments, but to show connection between them and grace. Both baptism and reconciliation absolve sin and instill grace. The first row refers only to baptism, but the restoration refers to both: the one time baptism, and the grace we receive with ongoing forgiveness. It is through this grace that He leads us in paths of righteousness. Considering that the anointing of the sick is also part of last rites, the parallel here is somewhat obvious. The valley of death, in the context of the sacrament, can be metaphorical (spiritual or emotional pain, stress, etc) or physical (illness, deformity, physical suffering). I have heard a number of priests say that anointing of the sick sometimes brings physical healing but always brings spiritual healing. I fear no evil because God heals, and because earthly suffering is temporal. A whole separate study could be done just on the phrase “in the presence of my enemies” but for now I will leave it with the historical fact that no matter how much persecution the Church experiences, the Eucharist has always continued. This looks like an obvious prefiguring of the Oil of Chrism used in the sacrament of confirmation, also called chrismation. As the sacrament is deeply connected with baptism, the oil in the Psalm is connected with the overflowing cup. Through the acts of consecration (both direct (baptism and confirmation, marriage and holy Orders) and indirect (The rest of the sacraments, which renew and refresh our consecration), God grants graces. He is the goodness and mercy, and he promises to follow us, not give up on us, because we are His. And if we allow Him to lead us, or lead us back, He will lead us to His home. It isn’t that simple. Well, for some maybe it is. But after that experience, I wasn’t really sure where to go after my diagnosis. It wasn’t until I started having intense nerve pain in my feet that I went back to my rheumatologist, but she asked me why I hadn’t been in sooner. I shrugged. I wasn’t sick. I didn’t really think I had a reason. I think it was 2011 when I got my diagnosis of primary Sjogren’s Syndrome. I had suspected it for a while, but the first round of testing indicated a “probably not” because the most common markers were absent in my blood. At that time, my primary care physician discouraged me from bothering to seek a diagnosis because it wouldn’t change anything. From then on, I was scheduled every six months or so, and two things changed. First, my body started fighting me actively. Second, my rheumatologist rescued me. I had started thinking that having every single muscle in my body hurt was a normal thing. After all, as my primary care physician had said, it’s not like there’s anything we can do about it. The next time I went to see her, I said “I pray for blessings for you every single day. Thank you. Thank you!” It turns out that the things you can get used to, or at least get used to thinking of as normal, can be mitigated with good medical care. And this is why I’m writing this today. If you think you might have Sjogrens, or some other auto-immune disease, and you think there’s no point in bothering with a diagnosis, or that it’s not a “real” disease, just an inconvenience, you might be underestimating the medical field and how much better you might be able to feel. On the other hand, maybe you are one of those who just don’t feel too bad. I hope you are. I hope you never need to be on 17 pills a day like I am. I pray that your disease never progresses to the point of interfering with your life. I still recommend that you don’t belittle yourself into avoiding the medical care you should have, by thinking you’re just being a sissy. Maybe it’s the treatment your rheumatologist offers that keeps you from becoming a hot mess of symptoms. Or maybe you will catch a new symptom early and nip it in the bud because you have an expert on your side. In the long run, getting appropriate treatment isn’t going to do you harm, and might well be able to do you a lot of good. I was listening to the Drew Mariani show on Relevant Radio, and he talked about a time when a barista took offense because he offered to buy someone’s coffee. The someone was a female. As is often the case, in the name of progress, someone took umbrage at a kind gesture. On the show, he talked a little about chivalry, and then posed: Is chivalry really dead? Do women really dislike having doors open for them, or having their date pay for dinner? It occurs to me that chivalry really isn’t at all what we think it is. It’s not about subjugation. It’s not even about kindness. It’s about respect. Chivalry teaches respect. There is no getting around it, men have opportunities women don’t have. Most men are taller, stronger, and better paid than most women. (I am not arguing that it’s ok. It is not ok for women to get paid less if they are doing the same job, and it is not ok for women to be passed over for raises or promotion, if they are equally qualified.) It is far too easy for men to lord it over women, It is also easy for men to become passive and cease to pay any attention to women’s abilities, needs, and personalities. That, of course, breeds selfishness and narcissism. And the narcissist is going to want women to pay attention only to his abilities, needs, and personality. When men don’t respect women, we open the door for a harmful level of self-centeredness in society. And if women don’t receive care, they will start relying only on themselves and caring for only themselves. I’ve said before that love isn’t give and take. It’s give and give. When it’s each partner for his/herself, it’s take and take. Which isn’t love at all, it’s just two people using each other. The thing is, we all have potential fatal flaws, and some tend to be more present in men, and some tend to be more present in women. And, at the risk of sounding like I’m anti-man, I want to talk about men here. Disconnected men often don’t know what’s going on in their families. They aren’t there to see everything, and are often too tired to take over when they are home. even in my family, with my emphatically connected husband, “where’s the…” is always prefaced with “Mom?” They expect me to be the one who can locate things. (I tell them that if they would clean, they would know where everything is, but they don’t believe me. Again, that’s for another time!) It’s never “Dad? Where’s the tape?” or “Dad, can I go to my friend’s house?” As I hope I’ve made abundantly clear, it is not because my husband is a slacker, but because I’m the one they are most used to. Now, imagine a world where men never care for women. Let’s say they are told never to do something for a woman, because it will offend, so they stop doing. If they stop doing these things, they become less respectful and caring, not more. The phrase “Do unto others before they do unto you” has taken root in many homes. It makes husband and wife adversaries instead of partners. When a man feels unnecessary to anyone but himself, he will act unnecessary. Chivalry fights that. Chivalry means a man opens the door, because he is reminded that he cares for women. Chivalry puts women and children first, because he is reminded that women and children are of tremendous value. Chivalry reminds a man that he is capable of being kind, helpful, and useful. And that he can reach that box on the top shelf at the store. Chivalry isn’t to take away a woman’s agency, it is to remind her, and himself, that she matters. Far too many women have lived lives where they were treated like they didn’t matter. Far too many women still do. If we want to get rid of disrespect for women, there are a lot of things we need to do. We need to teach boys that no means no. We need to teach men that fatherhood means Daddyhood. We need to prepare young women for careers, so that they know that they are able to support themselves; and so that their husbands know. We need to teach all children that we take care of those who are smaller or weaker. Having a cat is a great idea. And we need to teach boys and young man honor. That they do for others because it’s the honorable thing to do. And that honor is a defining characteristic. Honor means not putting yourself first, and without an opportunity to learn honorable behavior, men will skip out on parental responsibilities, take advantage of women, and fear a woman who is career-prepared. Chivalry isn’t dead. I know because I married my knight. But the world needs a whole lot more of it. My feelings about my family are in no way a statement about smaller families. Everyone has reasons for the ways their lives form, some of them by choice and some of them not by choice. Nevertheless, having a big family as worked out to be a very good choice for us. Here are 10 reasons. 1o. Children with siblings aren’t lonely. Even if they have social impairments, family is where you find friends for life. Friends may come and go, but family is forever. 9. Grandchildren. Many parents with one or two children never get grandchildren because one doesn’t want kids and the other can’t have them, or similar circumstances. The more kids, the more likely grandkids. 8. Thanksgiving. I can’t imagine Thanksgiving without a table-full. Kids playing, adults sharing, generations interacting. It is one of the most beautiful pictures I’ve had the good fortune to experience. 7. The economy. Yes, you read that right. Social Security is dying because older people are living longer… The working people are the ones who support Social Security. The children of today are the workers of tomorrow. 6. Children learn to parent when they come from a large family. The older children learn by watching and helping with the younger. The younger children learn by watching and helping with nieces and nephews. When these kids grow up and have children of their own, they are often more prepared and less fearful because they are already experienced with child care. 5. Compassion. Children who grow up around those younger and weaker (siblings, nieces, nephews, cousins, etc) they have the opportunity to learn empathy in a way that is, well, close to home. 4. Learning to make sacrifices. I know there are a lot of reasons for small families, but there is one reason I sometimes hear that worries me. Parents want to give their children everything. I don’t. I want my kids to learn to work for a living. I want them to work for their education or go straight into the workforce. I want my children to know, right from the start, that they are loved for who they are, but that doesn’t exempt them from contributing to home or community. I want them to know how to share. I want them to know how to accept that they will get some of what they want, but nobody gets everything they want. 3. There are more important things than money. My generation was raised to think that our career and our income is our value. I never accepted that. I believe our true value lies in our contribution and the things that give us joy. Money may bring some pleasures, but it does not buy joy. Love brings joy. In choosing a lifestyle, my husband and I have decided that molding our choices around our family is far more important than having luxury cars or new furniture. And as a result, our kids know that they are more important to us than things that can be bought. 2. We are making the world a better place. If you get the chance, and can handle some really vulgar language, see the movie Idiocracy. The premise is that all the smart people have avoided having children and all the dumb people reproduced recklessly, until society evolved into complete stupidity. It’s amusingly done, but also carries a thought provoking message. I am doing my share to put people into the world who are compassionate and educated, and who are motivated to work. It’s good for the economy, and it’s good for society. And if more people raise children with values, maybe we can avoid ever seeing a program like “Ow My Balls” on television. 1. People are good. I believe that. Their existence is worth it. Lately I’ve been doing a whole lot more visual creating than writing. You can tell by the conspicuous lack of posts on Carmel Sundae. But for me, painting and art journaling and book binding have become almost a means of contemplative meditation, and one question keeps coming forward to me: why this obsession with art? Why do you feel drawn… why do you do it… why you, Christina? And 45 different answers seem to emerge. One day it is because I want something to keep my hands busy, and to experience the tactile expression of feeling the friction of brush or pastel on paper. Another day it is because God is a creator and I am made in His image so I have a natural desire to create something. Another day it is because I am intrigued by some new technique or supply I’ve heard about and I can’t wait to try it. What it all boils down to is that there are many, overlapping reasons I draw, paint, and bury myself in this obsession. What’s more, I have joined a number of groups and forums where I see other artists (dare I call myself that?) give reasons quite different from my own. And their reasons are just as valid as mine. One thing that I feared finding in the arts and crafts communities was exclusionary attitudes, and I have to say I’ve been relieved to find that such attitudes seem to be rare. Most people love sharing their craft with whoever wants to learn. Many have for-pay websites where they teach more formally, and I can’t find fault with someone who knows their bacon trying to earn it by doing what they love. I’m not in that position, but more power to those who are qualified or otherwise able to monetize. Me, I’m much more of a student than a teacher. Since I love being on a journey with fellow pilgrims, though, I invite others to join me on this travel. If you are more knowledgeable than me, feel free to contribute your voice of experience to the discussion. If you are just starting out, like I am, please feel free to learn with me and to ask questions. I love doing research, and if you ask something I don’t know, there’s a good chance I’ll be looking it up in short time. Most of all, I want to encourage you to have courage. I believe we are all called to some form of creativity, and if you have even the remotest interest in visual art, don’t let self-doubt arguments stop you. Professional artists are not more “real” than those who finger paint with the kids on the kitchen table, any more than those who only draw in their private journal are more noble than those who exhibit their work in galleries. The fact is that even on the same pilgrimage, any two pilgrims are on their own journey even as they walk side by side. So professional, amateur, public, private, these things mean nothing. Whatever you do, do it with great love, and with God beside you, and you have nothing to be ashamed of. Putting one of my paintings on the wall may bring a whole new meaning to hanging wallpaper. See, lately I’ve been experimenting with painting on wallpaper, and I absolutely love it! I have these books of wallpaper samples that I got for free when they expired, and they were just sitting there blinking sadly, begging to be used. As it turns out a little gesso makes them fabulously ready to take paint. What I like about them is that they have a feel similar to canvas, but they don’t need stretched. They won’t warp like paper, and I can lay them flat or tape them to a board on an easel. Either way, I like them better than either canvas or paper for a lot of uses. With regular gesso, they are a good medium for acrylic paint. (I am hoping to try ink or watercolor later today when my latest batch of gesso-wallpaper dries.) With an extra toothy gesso, like the clear gesso I have, it’s very receptive to pastels. And today I tried applying gesso with a palette knife and I really like the result. It goes on very smooth and thick, with no brush strokes and only minimal knife strokes. I think this is the one I will try with watercolor. It uses a bit more gesso than my usual brush applications, but if it comes out velvety like I am hoping it will, it may end up being my new favorite. 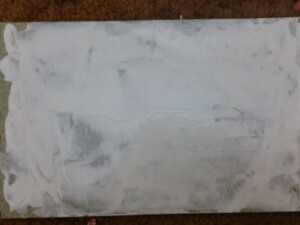 Here is the knife-applied gesso, after a single coat. It’s half dry. The large darkish blob near the middle is a reflection of my head. And here is one of my first two works to appear on Etsy, Entitled “Blue Child.” It is part of my Autism Series, and was painted on wallpaper. 1. Manna is about trust. God keeps laying out the manna in my life, too. And I keep wanting to collect it up and save it till it rots, because stupid me, I keep forgetting to trust. What is it that is so hard-headed that I still worry that even though the sun has risen every day since creation, tomorrow it might not rise? And if it didn’t, how could I be so foolish as to think that there’s anything I could do about it? 2. Manna is about gratitude. God has already kept the Israelites alive until this point. But instead of praying to Him that they are hungry, they grumble that He is starving them. I’ve grumbled, too, so many times. Sometimes it’s not really about trust but about comfort. 3. Manna is about patience and forgiveness. God’s that is. They grumble, He provides. I guess He understood that they were still children in their faith, having been brought up in godful Egypt. 4. Manna, and the whole desert experience, is about slavery. It’s pablum to wean the child off of the infected mother’s milk of children who have never known freedom. Like the talking horses in The Horse and His Boy, they do not yet know how to run to their fullest power, because they are still inhibited by having been slaves. They are not yet ready for Everything, so God first teaches them that He will provide Everything. Depend on Him, and He will meet your needs in the way He chooses. 5. Manna is about complaining. Complaining is a special kind of tunnel vision in which we can easily get so wrapped up in criticizing God for what we don’t have that we forget to bless Him for what we have. The Israelites griped about having nothing but manna, even as they roasted their quail. It is awfully easy to get caught up in complaining to God that He doesn’t do things the way we dictate, rather than thanking Him for doing things according to His infinite love. In the end, until we stop complaining about the manna, we aren’t ready to get to the milk and honey. Forty years I endured that generation. I said to myself ‘They are a people whose hearts go astray and they do not know my ways. So I swore in my anger they will not enter into my rest. I would like to go on record here as saying that I see very little difference between “art” and “craft.” Or at least, I would say it’s a very slight difference that is often used as a difference without distinction. I suppose by definition, craft is a skill that is learned to create something functional, where art might be perceived as purely decorative. In reality, however, the definitions don’t always work. A decorated canvas is usually seen as art, where a decorated gourd is seen as craft. Is the gourd necessarily useful, or is it purely for decoration? For that matter, is the canvas necessarily decorative? But my big concern here is that “art” and “craft” are terms that are subtly used to divide. “Art” is something we see as beyond the ability or scope of the common person. It might raise the esteem of the artist while intimidating the crafter. It also limits: the artist might never see beyond the scope of a given medium, often as taught by generations-old tradition, and a crafter might glue delightful collages but never find the courage to paint with oils. Children don’t have that kind of limitation. They will probably name their school project with crayons art, but also the bottle covered with masking tape and shoe polish. Or maybe they will call them both craft; because it really doesn’t matter what you call it. 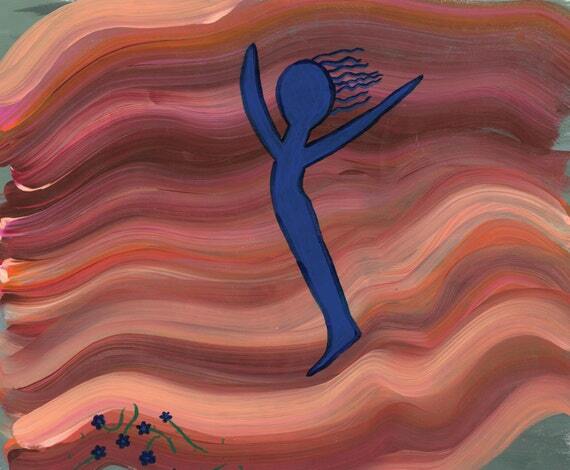 What matters is the joy of creation and self-expression. What matters is that it came from that place deep inside that is so unique that no two people can produce the exact same results. It is an expression of sheer, undiluted personhood. My Charming and Patient Husband considers himself neither artist nor crafter, yet like the child he makes little distinction. Art and craft are those things I do in that room at the end of the hall. Whether I am decorating a box or painting with watercolor, it’s all the same at its root: that desire to create, and to reach into creative personhood. Why is it that children and my husband get what people who are really close to the subject have difficulty with? Maybe it’s exactly that closeness. As we age, ego sometimes replaces what we know in our hearts. Sometimes we start needing to view “otherness” as somehow above or below us to assuage our growing insecurities. Whether we think we are too good or not good enough, it all comes from the same place: the concern for how others will see us. Increasingly aware of the fact that the world around us will judge us, we start wondering whether they are right to put us in our places. Maybe, we fear, our value really is determined by other people. Our value is determined by the personhood that is at the core of our being. It is from there that our creative urge swells and burbles, not from the court of public opinion. So if you want to call it art, or if you want to call it craft, go for it. The terms themselves can be useful as long as we don’t let them limit ourselves. 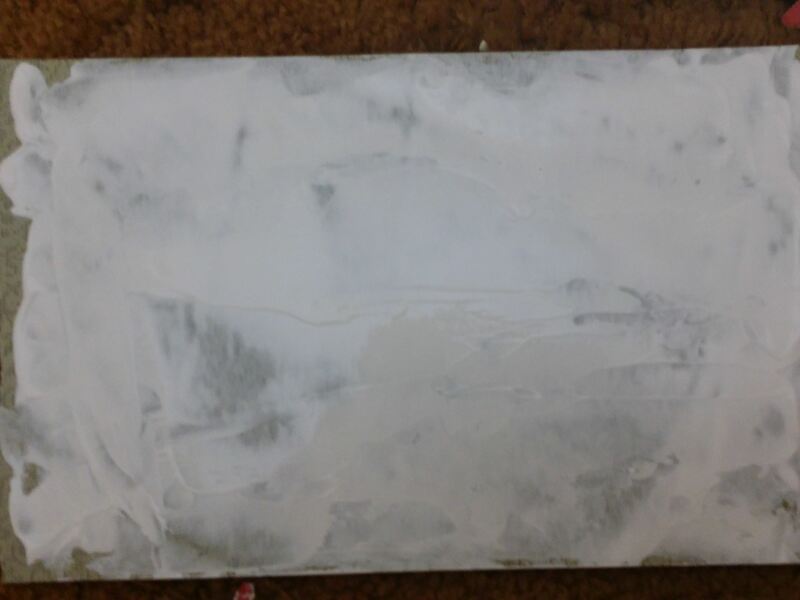 Meanwhile, I’ve got something to gesso, and it’s anyone’s guess whether it’s an art or a craft.